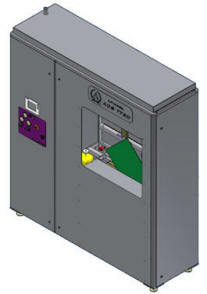 The ACS Model TT30 HASL was specifically designed to meet the latest requirements of the Lead-Free HASL process. The ACS Model TT30 HASL systems new features include; Solder Pot with increased Solder Flow and Solder Flow Stand-By Mode Feature. Robust Hot Air Reservoir’s for both the Front and Rear Air Knives. The ACS Model TT30 is built to the highest standard. Simple operation and maintenance procedures are features of the system. The ACS Model TT30 is designed with operator safety and simplicity in mind. The system is fully enclosed with stainless steel interlocked doors and a safety window. All covers are easily removed to allow access for cleaning and maintenance. The revolutionary TruTrack System, when leveling the PCB’s at the 45° angle, clamps the top of the PCB while bottom of the PCB is supported by the TruTrack System. Traditional Clamping techniques only clamp the top of the PCB and have no bottom support for the PCB. We have found that supporting the PCB at the bottom guides the PCB instead of pushing the PCB into the solder pot. This breaks the surface tension of the solder pot and eliminates the PCB from bowing which provides superior front-to-back uniformity. In addition, there is no need to punch holes in your PCB’s to asset in Clamping. The ascent and decent stroke of the Clamp Assembly is AC motor driven. Electronic driven Clamp Assembly provides a more precise and consistent travel of the Clamp Assembly. Solder Pot: Robust Solder Pot manufactured with high grade ¼” thick Stainless Steel material to withstand higher processing temperatures. Solder Pot Motor: The Solder Pot Motor is driven by a variable drive motor which enables you to adjustable Solder Flow. Solder Pot SBMF: The Solder Pot Stand-By Mode Features reduces dross build-up in the Solder Pot while PCB’s are not being leveled. If the system has not been cycled for 30 seconds (time is adjustable), the Solder Pot Motor will automatically reduce to minimal speed slowing down the Solder Flow. Hot Air Reservoirs: Each Air Knife is supplied with 824 cu/in Hot Air Reservoir. That is 1,648 cu/in of Heated Air! Double Cycle: Automatic double cycle feature if you should need to double cycle a particular job. Programmable Logic Controller (PLC): The PLC controls and or monitors all the functions of the Model TT30 HASL system. Operations Parameter Display: The Touch Screen is the main controller of the system. You can adjust the Set Points of the Clamp Arm Up/Down Speed, Clamp and TruTrack distance, Dwell Time and Level Time. Solder Pot Temperature, Solder Pot Flow and Air Knife Temperature. Fault and Alarm Screens assist in instant trouble shooting. Manual Functions: Operator can manually close Safety Door, Open/Close/Blow the Air Knives Adjust Clamp-TruTrack and Clamp Assembly up/down position while the machine is not in operation. Air Knife Adjustments: The front Air Knife angle can be adjusted. The front and rear Air Knives distance is adjustable. Flux Chamber: Exhaust travels through the Flux Chamber. The Flux Chamber greatly reduces the amount of flux build-up in your facility exhaust ducting. Construction: Balance of system constructed of High Grade Stainless Steel. Manuel Safety Door: Ensuring the safety of the operator during the leveling cycle. To complement the HASL system, ACS offers a complete line of Horizontal Pre/Post Cleaning Systems, Fluxing Systems, Dryers, and Material Handling Systems.